The buck that peeked into John's ground blind in 2011  a big mistake! This was a 2-1/2-yr-old, 5 pointer. 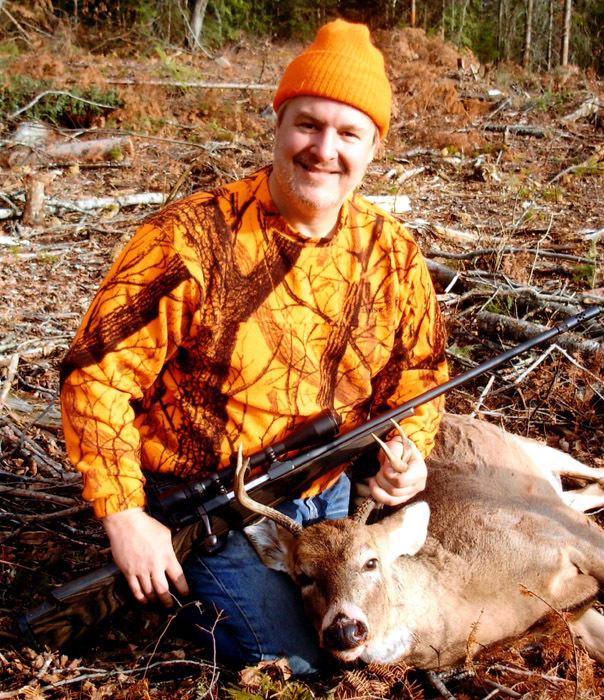 Our past November (2011) firearm deer hunting season is one we'll never forget. The outlook wasn't good. About half of the wilderness area that we Nordbergs have hunted for the past 21 seasons (since 1990) had been logged off  reduced to dirt, rocks and smashed branches. Half as much suitable habitat remaining, two previous winters of belly-deep snow and ever increasing numbers of wolves had reduced our deer population to roughly six per square-mile (from 11 a few years ago). We had hoped additional deer would be attracted to our area by the new clearcuts, but because of drought-like conditions throughout summer and fall, very little of any food attractive to whitetails could be found in any of these areas. To help insure we would again enjoy an acceptable quantity of venison sausages during the coming year, we therefore elected to suspend our self-imposed camp rule of taking older bucks only, eight-point, 3-1/2-year-olds or better. This season we decided, "If it has antlers, don't pass it up." To make matters worse, despite the fact that breeding had begun, throughout our first three days of the hunting season, a blustery wind with frequent gusts of up to 45 mph not only knocked down trees but made most whitetails (not quite all of them) nervous enough to remain in their bedding areas throughout daylight hours. On opening morning, however, soon after my son, Ken, and his son, Ryan, returned to camp for lunch (about 11 a.m.) an unusual sequence of events occurred. While Ken was seated on the latrine (in the woods) next to his wall tent, he spotted a deer moving through dense popples and alders a short stone's throw away. He dashed into his tent, grabbed his rifle and returned to his seat. Intending to keep an eye on the west leg of the logging trail coursing past his tent, adjacent to the area where he saw the deer, he was hoping it was a buck and hoping it would soon cross the trail. 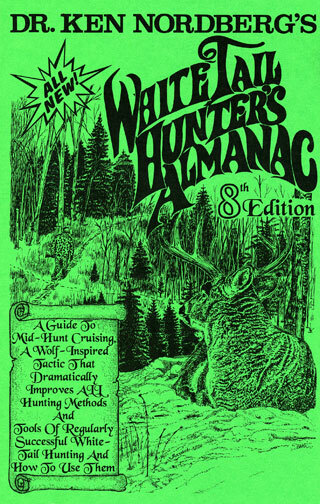 About then, however, he heard branches snapping in the pines behind him on his left and a moment later a four- or six-pointer (he couldn't tell which at that moment, but it was a buck and it seemed big) stepped out onto the south leg of the trail, walking swiftly toward the spot where the first deer had been seen. Ken didn't hesitate. From the comfort of his toilet seat, he swung his rifle to his left, took aim and fired. An hour later, we were all admiring Ken's deer hung behind camp, a four-point 2-1/2-year-old without brow tines, and pleased there would be at least some sausages in our freezers this winter. The next unusual encounter was not long in coming. It was my grandson Jimmy's turn. On Sunday morning, we decided Ken and Ryan should drop Jimmy off west of Four Bear Hill (named by my wife Jene and I after encountering a sow with three cubs there) on the way to their stands further up north. 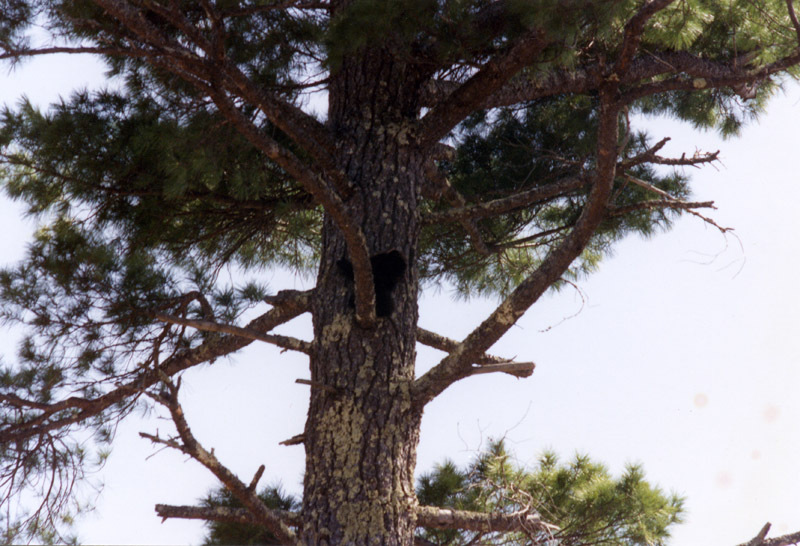 One of Jene's photos of the black bear cubs Doc and Jene saw that day. Jimmy's chosen spot had a long history of blunders involving ten-pointers. "I'll never forget the time," I told Jimmy, "when Jeff (my daughter Katy's husband) sat there. I was sitting on a hillside in the woods across the grassy meadow west of there. Later, when I glanced back toward Jeff, I couldn't believe what I saw! Jeff was sitting facing Four Bear Hill while a really big 10-pointer stood about 20 yards behind him in the grassy meadow, watching him. That buck got away without anyone firing a shot." To make certain he didn't make the same mistake, Jimmy sat at this spot with his back to Four Bear Hill, watching the grassy meadow. After about an hour of patient sitting, a movement on his left caught his eye. Upon slowly turning his head, Jimmy was astonished to see a four- or six-point buck (Jimmy wasn't certain which) standing only seven feet away, looking at him. It had silently approached him via the same trail used by the three hunters earlier. Because Jimmy was wearing a camo head net and sitting very still, the buck was obviously unsure of what it was looking at. Caught with his rifle on his lap, Jimmy didn't move (the right thing to do). Shortly thereafter, the buck decided to continue on its way and walked right past Jimmy, making a slight detour. Thinking it was now safe to move, Jimmy silently cocked his 30-30 and began raising it to his shoulder. Somehow, however, the buck spotted this motion and began moving more rapidly, trotting. As you might imagine, my teenage grandson was more than a bit excited at this point. This was his first opportunity to take a buck. He fired once, but sadly, he missed. "We've all missed bucks," I told Jimmy later. "All of us, except maybe your uncle Ken, can talk for hours about bucks we've missed for one reason or another. You never forget those times." My turn came Wednesday afternoon. I was sitting on my stool amid a small but dense clump of hazels and young red oaks with retained leaves on a 20-foot high outcropping. My back was to a narrow, recently logged, power-line-like opening. I was keeping an eye on a snow-covered scrape and rub trail recently traveled by a buck with six-inch-long tracks, tip through dewclaw. After about two hours had passed, I felt the urge to look behind me, downwind, and there, directly below me about 30 feet away stood a spike buck. It had lots of white on its head. "When mature, it will be a beautiful buck," I was thinking. Though I was 20 feet above it, it had apparently gotten a whiff of me because it was standing frozen, tail half raised, studying my woody clump. My camo head net and camo-blaze-orange coat and cap were doing there job however, obviously making it difficult for the young buck to distinguish me. It couldn't decide whether or not it was in danger. After a long five minutes of this, the buck began moving gingerly forward (heading crosswind), halting about every ten feet to reassess the situation, its tail wavering between half-raised and fully raised and half-fanned and fully fanned. All the while I could have easily taken this buck, but I already had one hanging in camp and I knew none of my partners would have been particularly pleased to put their tag on a spike buck this early in our hunt, so I let it go (a couple changed their minds later to no avail). All that first week, the last hunter to return to camp was my son, John. Having not been successful at taking a buck for several seasons, he was working especially hard to succeed this year. By the next to the last morning of our planned hunt he was complaining often about a sore back. Despite the near presence of some very fresh tracks made by an unusually large buck earlier that morning, by 10:45 a.m., he could no longer sit without motion on his stool on the spruce fronted rocky prominence overlooking one of our new clearcuts. He decided to lie down flat on his back next to his stool on a bare slab of Canadian shield to ease the pain. When questioned about it, he wasn't certain whether or not he had fallen asleep. [Note from John  I took some teasing after this incident. However, my problem that morning wasn't "back pain," or falling asleep. I had developed a cramp on the my left side of my abdomen. About fifty minutes earlier, I had spotted 3 does about 200 yards across the clearcut. During that time, they were feeding and slowly moving towards me. At least one of the three does always had a head up looking roughly in my direction. If I had moved they could have spotted me during this entire time. Due to seeing fresh 6 inch tracks that morning, I had kept my gun up and ready to fire for that entire time. This led to the cramp in my left side. I laid down after they had moved out of sight to my left. Since I am the webmaster, when it comes to my father's articles about me, I get to correct the record.] All he remembered was turning his head and being startled by the sight of an adult buck staring at him only ten feet away, peeking over the edge of his granite bed. John was wearing his camo head net, so in this case, too, the buck was unsure of what it was looking at. The moment John moved, however, the buck backed away, disappearing from sight, and trotted around the front of his rocky prominence, heading northwest. Seventy-five yards uphill to John's right it halted and turned broadside to look back. Standing tall now and aiming off-hand at the buck's chest, John fired. The buck whirled, took for bounds and plummeted into a tangle of smashed clearcut branches. When my old hunting partner, Silver, and I came out of the woods and clearcuts an hour later, we found a cryptic note attached to the driver's side window of my pickup. It said, "Got a six-point! John." "Good for John!" Silver and I responded in unison. 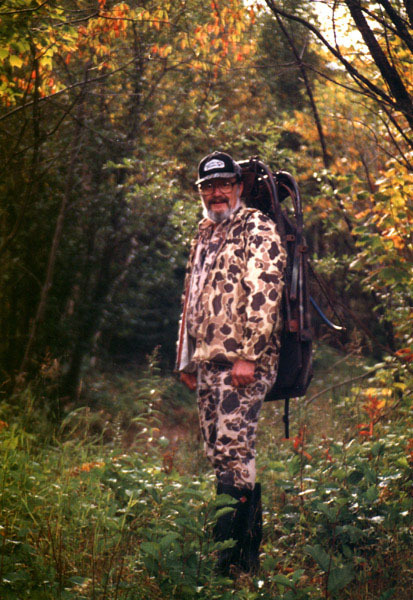 John sitting on his portable back-pack/stool wearing his camo head net. 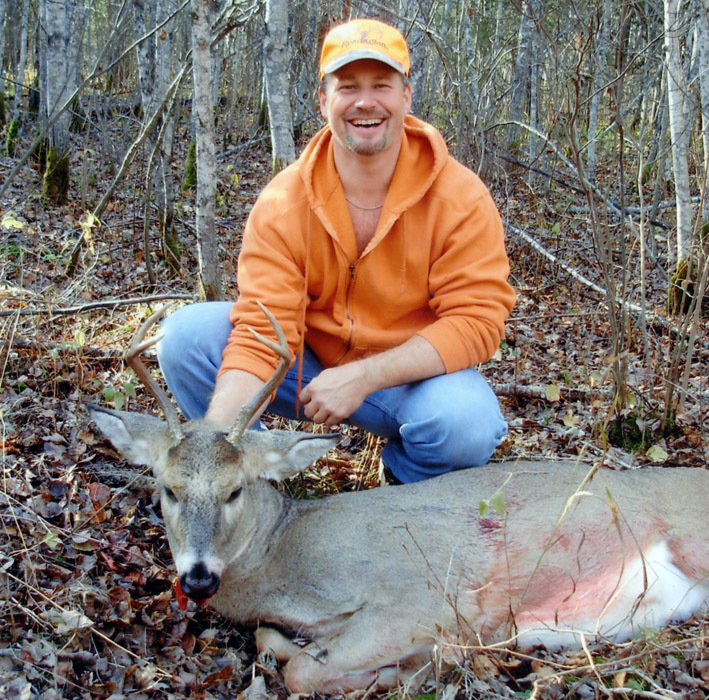 Two important points to keep in mind are parts of each of the above descriptions of unusual encounters with bucks experienced by some of my hunting partners and I this past hunting season. 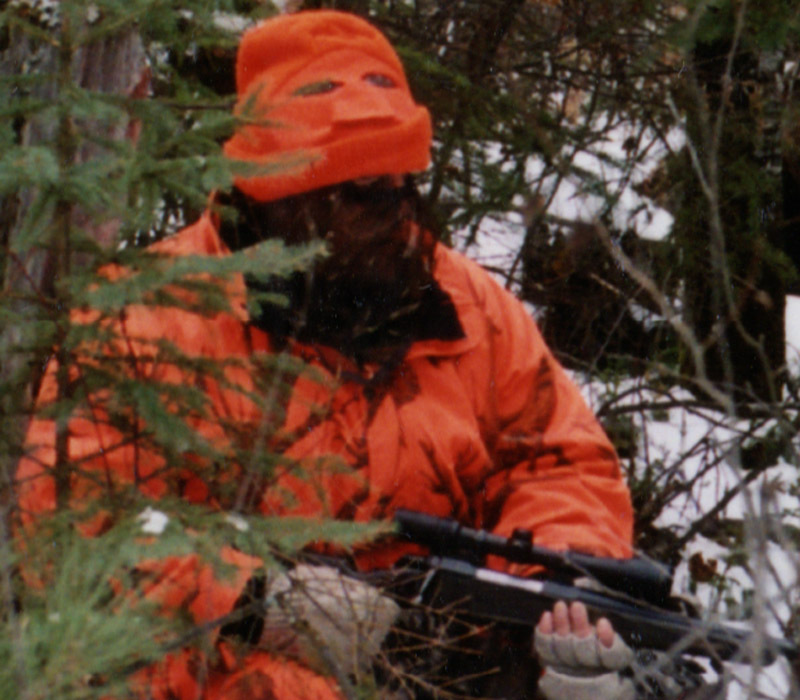 One is, always wear a camo head net (or mask) when sitting at a stand site (always sit, too), blaze-orange cap on top for safety. 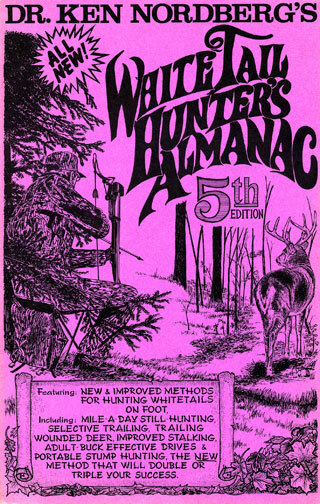 Not only will this make it much more difficult for whitetails to identify you, even at extraordinarily short range, but it will greatly improve your odds for an easy, short range shot at a standing or slowly moving deer. Number two is, never give up being extra alert, cautious and patient because you can rarely be sure when or where you'll spot you next deer.